Gaetano Berardi has been patched up and passed fit for the game against Queens Park Rangers after suffering a nasty cut to his head in Saturday’s defeat at Rotherham. The Swiss defender is expected to start again at right-back, despite the head wound which left blood streaming down his face and led to the dismissal of Rotherham striker Matt Derbyshire. Leeds's Gaetano Berardi took an elbow to the face against Rotherham United on Saturday. Picture: Tony Johnson. 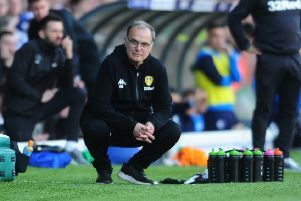 Derbyshire was sent off in the 61st minute of Leeds’ 2-1 loss at the New York Stadium after catching Berardi with an elbow. Berardi, who had his nose split open in similar fashion by Leon Best when the clubs met at Elland Road in November, was incensed by the challenge and needed several minutes of treatment before returning to the field with his head heavily bandaged. Evans eventually substituted him in the 74th minute and said the full-back had needed stitches in the cut. Rotherham manager Neil Warnock described Derbyshire’s dismissal as “harsh” and said the club would appeal against it but Evans said: “They’ve got no chance with an appeal. I’ve watched it again and he (Derbyshire) clearly leads with his arm. It’s in an unnatural position so I don’t think they can have any complaints. Matt is not the type to do that on purpose but he caught Berra and everyone saw the state he was in. United have no other injury worries beyond the long-term ankle problem which has kept second-choice goalkeeper Ross Turnbull on the sidelines since October but both Marco Silvestri and Souleymane Doukara are suspended - the latter now one game into an eight-match ban for biting Fulham defender Fernando Amorebieta in February. Centre-back Giuseppe Bellusci, whose error led to Rotherham’s late winner on Saturday and forced him to step in as a makeshift keeper following the dismissal of Silvestri, is now two bookings away from a automatic three-match ban for amassing 15 yellow cards.